When it comes to talent, Vadoud Mo'azzen is a creative powerhouse. Besides being an accomplished singer, painter and poet, he plays the tar and saz, two traditional Azerbaijani musical instruments. This multi-talented Azerbaijani was born in 1960 in the historical city of Ardebil in Southern Azerbaijan (Iran). His last name, Mo'azzen, sometimes transliterated as "muezzin", refers to the person who calls faithful Muslims to prayer. Several of Vadoud's ancestors were famous muezzins, so clearly vocal talent runs in his family. Vadoud has performed in Iran, Europe and America; in 1999, he toured California with Zoya Sabet, a vocalist who is originally from Gilan (Iran) and now lives in Los Angeles. 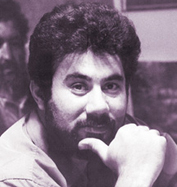 The two of them recorded a CD together in Los Angeles with Parviz Gharib-Afshar's Shiva International Enterprises. Vadoud began studying music in 1980 and has trained with famous masters such as Agha Khan Abdullayev (in Baku) and Nasehpour (in Iran). 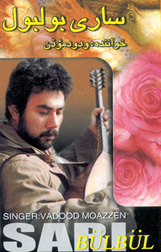 Some of the songs on his recently released album, "Sari Bulbul" (Yellow Nightingale), reflect this influence of traditional ashug and mugham [modal] singing; examples include "Uzum Daghlar" (Towards the Mountains) and "Sara". Besides singing in a traditional style, Vadoud also experiments with Western-style electronic music and what might be called "metropolitan" singing, inspired by his life in Tehran. But Vadoud's music is only half of the picture. His passionate nature and romanticism are also deeply reflected in his oil paintings, which tend to depict pastoral landscapes, provincial village scenes and other images of pastoral life in the regions surrounding Ardebil. He has also painted portraits, including that of Shahriyar, one of the most famous Azerbaijani poets from Iran. Left: Vadoud's "Sari Bulbul" Album. 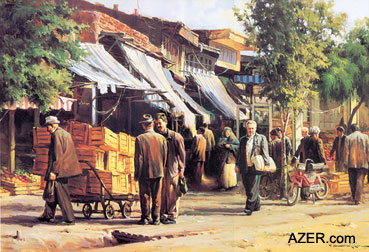 Right: Painting of the Anzali Bazaar near the Caspian Sea. Vadoud began painting at the age of 12 and later went to Tehran and Turkey to complete his art education. He has exhibited in Iran, Germany, France and Canada and also has had a solo exhibition in the United States. In painting after painting, Vadoud's love for Nature and rural life shows through. For instance, his painting of the Anzali bazaar near the Caspian Sea is alive with strolling shoppers and vendors displaying their wares. In his depiction of snow-capped Savalan Peak, a famous mountain in Southern Azerbaijan, Vadoud shows a shepherd solemnly watching over his sheep while overhead, the sun peeks through the clouds. This realistic-romantic style captures the rich colors, lush landscape and essential spirit of Vadoud's homeland. Left: Painting and book cover "Savalan Heights in Spring". In fact, you might say that his voice echoes his paintings, and his paintings reflect his voice. There is a certain cohesion and unity between the two, as they both invoke the picturesque and tranquil images of everyday life in rural Southern Azerbaijan. To order the art book "Selected Works of Vadoud Mo'azzen (1991-2000)", contact Yassavoli Publications, Bazaarcheh Ketab, Enqelab Ave. 13146, Tehran, Iran. Tel: (98-21) 646 1003; Fax: (98-21) 641 1913; ISBN #964-306-193-0. To order the art book "Manifestation of Feelings: The Selected Works of Vadoud Mo'azzen - Oil Paintings" (2001), contact Mirdashti Farhangsara, Tehran, Iran. Tel: (98-21) 649 0661/-2; Fax: (98-21) 649 0653; ISBN #964-7141-24-6. To order Vadoud's cassette "Sari Bulbul", contact Avaye Nakisa in Tehran, Iran. Tel: (98-21) 311 2435 or (98-21) 390 2048. To order Vadoud's live concert CD "Ay Giz" (Hey, Girl) or Vadoud's concert CD with Zoya Sabet, contact Parviz Gharib-Afshar, Producer, Shiva International Enterprises, 2265 Westwood Blvd., PMB #566, Los Angeles, CA 90064 USA. Tel: (310) 657-1000; www.gharibafshar.com.